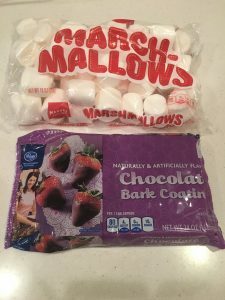 The final quick and easy treat for today is chocolate coated marshmallows. The idea here is to get the delicious taste of a chocolate fountain treat without actually having to get out the chocolate fountain. My kids love helping coat the marshmallows in chocolate. 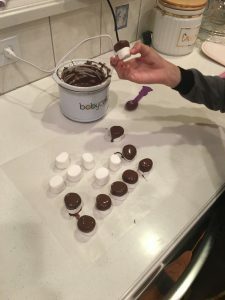 Simply melt chocolate – I melt the chocolate in the microwave and then use an electric melting pot so that the chocolate stays warm as we are making these and we do not have to rush to finish before the chocolate hardens. Hold the marshmallow by one end and dunk the other into the melted chocolate. Then place the half-coated marshmallow onto wax paper to cool. Once completely cool, these tasty little treats can served on a platter, or in a bowl. Be sure to make more than you think you will need as no one can eat just one!